The company believes that education is a necessity of the future, therefore the company has setup a school on all their construction sites to educate the children and to prepare them for the challenges of the future. The company offers this cost free service to all the families working on the construction site. While the parents are at work, the children are taught, fed and looked after by 3 teachers and 2 co-ordinators. The education provided strives for a balance between the search for understanding, the acquisition of essential knowledge, skills, the development of positive attitudes and the opportunity for positive action. The kids learn about various subject areas including visual and performing arts. The education initiative also ensures the safety of the children on the construction site. The company also arranges for picnics and educational tours for these children on the weekends. Teerth Realties appreciates the recent opportunity provided by Mercedes Benz International School to all the children, by getting them involved in their school CAS activities. 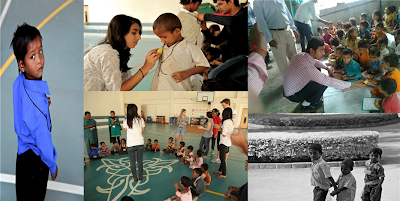 This month the senior students of MBIS hosted a fun-filled activity weekend for the kids. Here are a few visuals of the day.